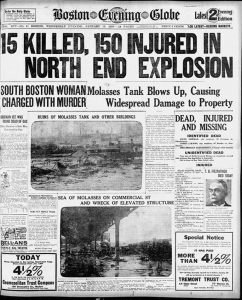 Great Molasses Flood 1919 Boston: 100th Anniversary. What the heck does the Great Molasses Flood of 1919 have to do with Head Lice Treatment you may ask?Inspired by the physics of the molasses flood at NitWits we apply the same theory to lice treatment. That’s right folks, a flood of conditioner applied to your scalp will drown out and suffocate the sturdiest of head lice. Because head lice exchange oxygen (breathe) through little tubes in their shells called spiracles. The secret sauce here is to clog up those spiracles with OMG Head Lice Conditioner Solution. Suffocate lice with OMG Head Lice Conditioner Solution. First of all once you start to clog up the breathing tubes of head lice, they slow down and start to die. Why is this important? Because it make the lice easier to pull out of the hair with the OMG Lice Comb. In fact head lice become disabled and disoriented once they are starved of oxygen. In addition OMG Conditioner makes it difficult for the lice to hold on to the hair shaft. Therefore pulling the lice out of the hair becomes extra easy. Furthermore any lice you dislodge from the hair are no longer viable once off a human scalp. Because head lice need frequent blood meals, at least every 3-4 hours. In fact celebrations and commemorations are happening all over Boston to mark the Great Molasses Flood 1919 Boston: 100th Anniversary! And at NitWits we celebrate the fact that head lice can be treated easily and safely without pesticides! In addition pesticides no longer work to kill lice. Therefore you know you can treat lice at home with this good DYI solution. If you need help contact us here at NitWits. What’s more we will set you up with a same day appointment.